TimeTec BLE-2 Control Board functions as an intermediary device between a user’s Mobile App and the barrier gate controller, whereby a user can tap on his/her Mobile Ap or send a voice command to TimeTec BLE-2 via Bluetooth connection. TimeTec BLE-2 will then translate the command into digital pulse and instructs the opening of the barrier gate. 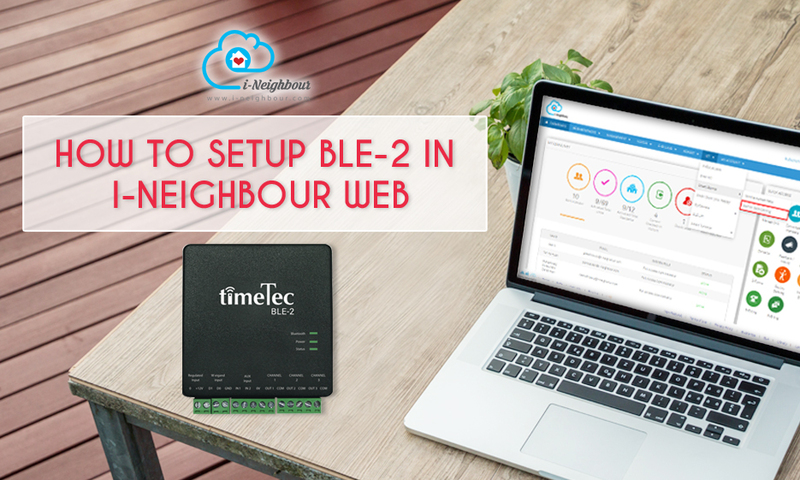 Hence, we have prepared a short guide on how to setup BLE-2 in i-Neighbour web. 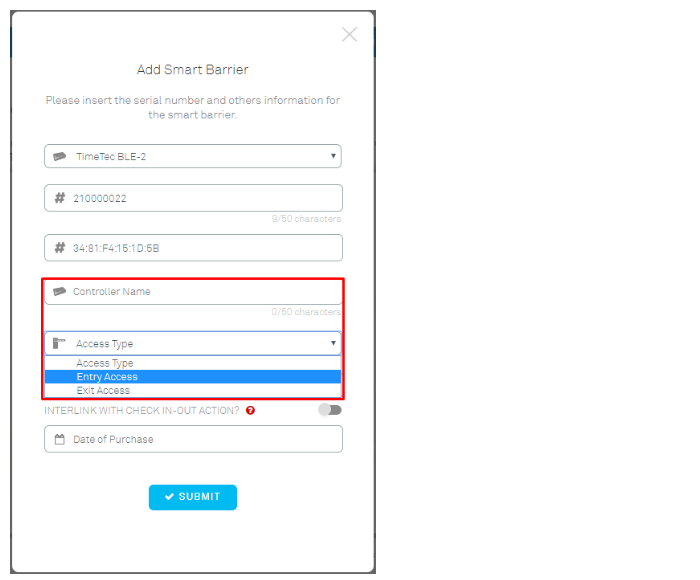 Login to i-Neighbour admin web portal, select IOT > Smart Barrier > Barrier Gate Setting. 2. To add BLE-2 in system tab on Add at top right. 4. Enter BLE-2 serial number. 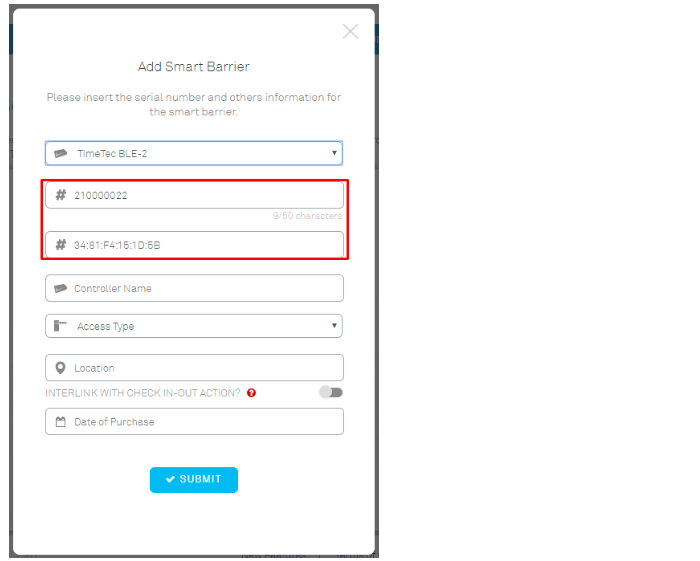 Mac address will automatically fill after you enter serial number. 5. Choose Controller name for example Entrance. 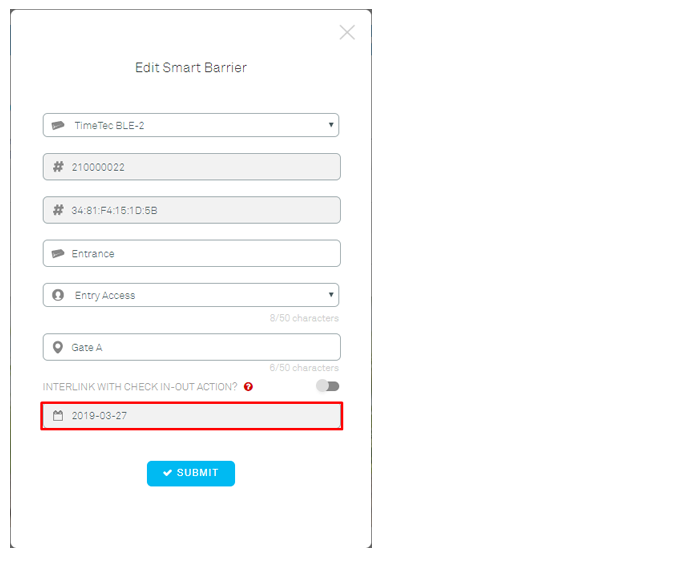 Then select access type to control BLE-2 that have be install in barrier gate. 6. 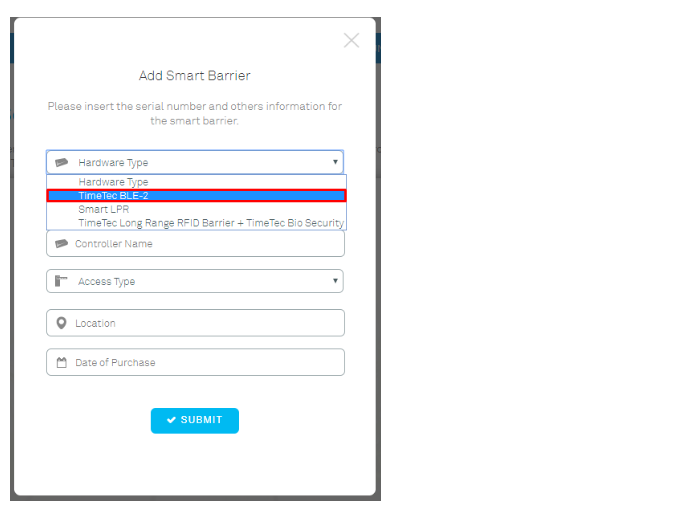 Choose your purchased BLE-2 date at calendar in red box, then submit. 7. You can see BLE-2 after you added in Barrier Gate Setting. 8. 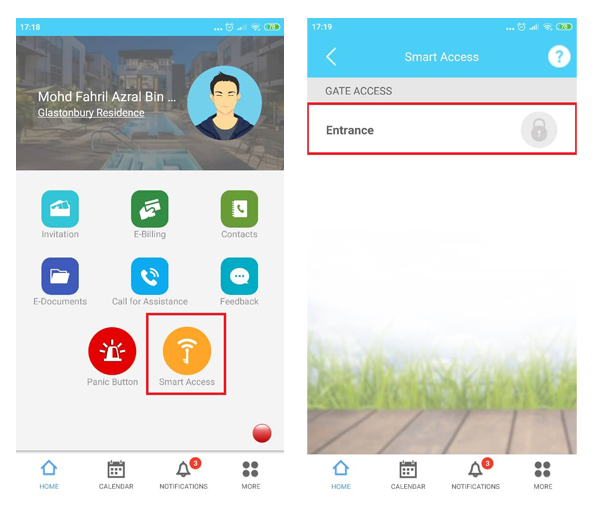 To setup barrier gate for resident, select IOT > Smart Barrier > Vehicle Access Pass. 10. Choose TimeTec Smart Phone Access (BLE-2) and choose how many car park to setup for resident. 11. Choose pencil icon at right screen to enter resident detail for parking lot. 12. 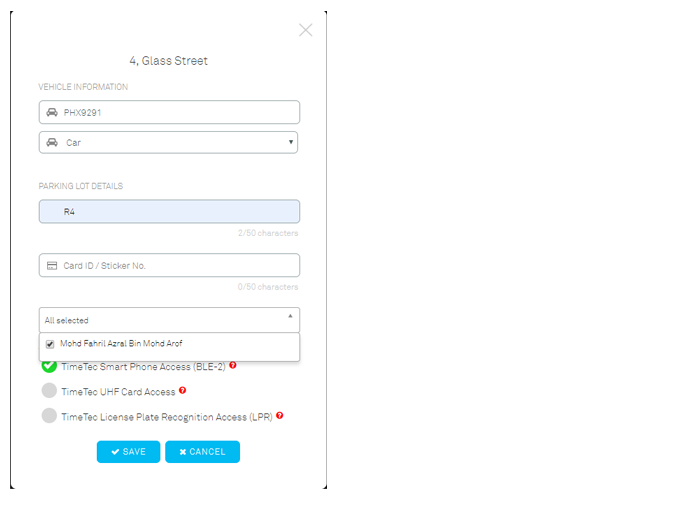 Enter resident detail and choose BLE-2. 13. Once done, you can see resident parking lot has been successful. 14. Resident can see Smart Access in i-Neighbour Apps. Assalam tuan.saya mempuyai lebih kurang 80 pintu fingetec + dan beberapa kadex yg dikawal selia oleh server...masalah saya server sangat lambat dan selalu crash database...dan dicadangkan supaya menukar kepada server baru yg lebih power..boleh x awak cadangkan kepada saya keaadan yg paling sesuai untuk masalah saya ini..boleh contack.saya di talian 012 7486246 untuk info lebih. If you want to connect up almost up to 100 devices, we would like to suggest for you to have a high end server with the specs as per listed below.